Home Banking How to Check Andhra Bank Account balance? 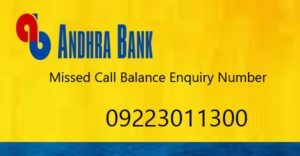 How to Check Andhra Bank Account balance? Many customers find it problematic to find their remaining balance in their bank account. they use passbook update or ATM Card to find their Bank Balance which requires you to visit the Bank branch or ATM. Andhara Bank Provides various method which does not require you to leave the comfort of your home to find the Andhra Bank Account Balance. Andhra Bank is a medium-sized public sector bank of India. It is established in 1923. Andhra bank has a network of 2803 branches, 4 extension counters, 38 satellite offices, and 3636 ATMs as of 31 Mar 2016. The bank operates in 25 states and three Union Territories. Andhra Bank is a pioneer in introducing Credit Cards in the country in 1981. Andhra Bank provides Account Balance check by following ways. Andhra bank offers a toll-free number which can be availed by calling on this number 09223011300. The call will be disconnected after a few seconds and an SMS will be sent on your registered mobile number (RMN) with all the necessary details. Andhra Bank in their SMS Banking service provides balance check by sending SMS in a certain format to the 56161. Andhra Bank has their online portal that enables its user to login into their account. Andhra Bank Net Banking, One can check balance with net banking facility along with many other details related to the account. Andhra Bank has different apps which makes it even easier for the user to reach his details faster and convenient. The download link for the respective devices is down below.